Since the beginning of the week the pairNZD/USD has been trading within a range of 50 points (0.8250-0.8300). Uncertainty of the market is determined by controversial factors. From one hand, investors are waiting for the NZRB to raise interest rate, and the anticipation increases the demand of New Zealand currency. From the other hand, at the first Global Dairy Trade auction this year the prices have dropped down by 0.8%. As for the USA, FOMC Minutes will be published today, explaining further policy of the regulator. Today the pair will probably continue to trade within the channel. 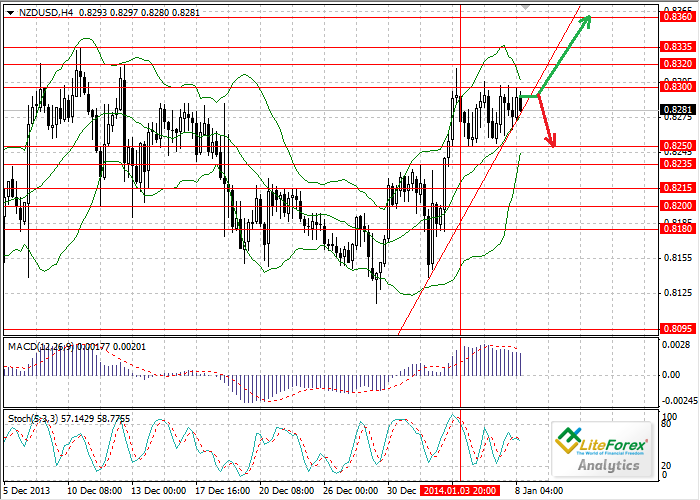 The key level is 0.8300, its breakdown will open the way to the levels of 0.8320, 0.8335 and 0.8360. On the four-hour chart Bollinger bands are getting narrower, forecasting strong movements of the price. Long positions with targets at 0.8360 can be opened above 0.8300. If the price breaks down the level of 0.8275, short positions with take-profits around 0.8250 will become an obvious strategy.